The United States likely surpassed Russia and Saudi Arabia to become the world's largest crude oil producer earlier this year, based on preliminary estimates in EIA's Short-Term Energy Outlook (STEO). In February, U.S. crude oil production exceeded that of Saudi Arabia for the first time in more than two decades. 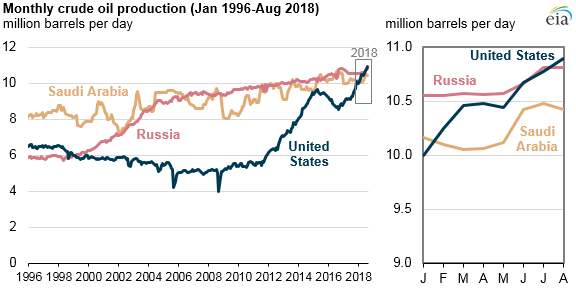 In June and August, the United States surpassed Russia in crude oil production for the first time since February 1999.